This article by Joseph Anderson is important on a number of fronts. First it details accurately much of what took place on Friday night after the sentencing was announced. The writer, along with photographer Jay Finneburgh, not only monitored and documented the march, but kept a phone line open to our studios so folks not inside the police lines could actually hear what was being said. What was described by Anderson, documented by Finneburgh and experienced by legal observers was a far, far, far cry from what was reported on the evening news when police held a press conference boasting about arrest numbers. When we were down on the corners of Sixth and East 17th, we along with folks from the Lawyers Guild were told the entire block had been designated as a crime scene because someone threw rocks at officers and everyone was being arrested as agitators. That was never ever stated to Anderson and other marchers, who were all hauled away unless they were accredited press. During the press conference that evening, police didn’t talk about rock throwing but instead talked about a gun being snatched from a holster and how that ONE individual was quickly arrested. So why were 152 people arrested? What was the danger when the cops outnumbered the marchers? Read Anderson’s account and listen to the Hard Knock Radio interview we did with him on Monday, Nov. 8. 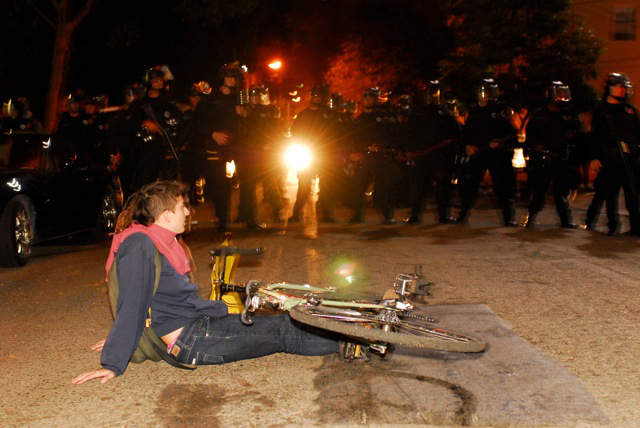 I was swept up and arrested Friday night in Oakland, California, at the end of the Justice for Oscar Grant march, on Nov. 5, 2010. 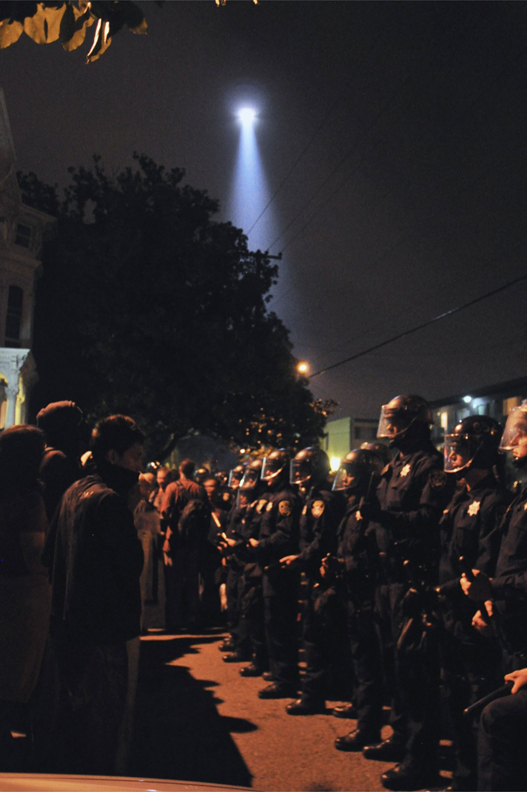 As usual, most of the Bay Area TV stations gave a factually awful – of course, very pro-police – spin to what happened. It amazes me how edited and re-chronologized video can make viewers think they are seeing something that they aren’t. Events are portrayed out of order, and most TV reporters falsely describe the context of the video clips they show. As in George Orwell’s book “Nineteen Eighty-Four” about a total propaganda media-controlled society, the lie becomes the truth and the truth becomes the lie. For example, many local stations showed video of protesters pushing down a chain link fence, calling it an example of vandalism. In reality, what the video showed was frightened overwhelmingly peaceful protesters trying to escape fully geared and itching-to-go riot cops who had tried to enclose the marchers and cops who were about to begin assaulting not just innocent marchers but also bystanders and, later, neighborhood people. I saw very young Black females, plus or minus 20-something, no more than 4 feet 8 inches in height, no more than 95 pounds, just peacefully sitting on a less than a knee-high sidewalk wall in their own neighborhood, trapped and being led off in handcuffs by aggressive, 200-pound riot cops. I saw an equally small, very young woman, a person of color, being aggressively picked up and slammed to the ground – face down like Oscar Grant – while being arrested and handcuffed. This in spite of a Black mayor, Ron Dellums, and a Black police chief, Anthony Batts, and a Black cop, L. Johnson of OPD, on the scene talking about “his men” over the police murder of a young Black Oscar Grant. Like Oscar Grant, none of us were armed, none of us were resisting and none of us – at least not where we marchers were entrapped – were violent. If you pay more attention, the pro-police spin of local TV media coverage doesn’t hold up. But at least two mainstream news reporters actually at the scene at Sixth Avenue and East 17th Street in East Oakland admitted that there was NO “widespread violence,” if hardly any, and NO bottles or rocks thrown at the police. They reported “one or two storefront windows broken” and “one AC Transit bus window broken.” This was what Jennifer (last name unknown) of KGO, with whom I talked, and another reporter, Josh Richman of the Oakland Tribune, his reporting live on KQED-TV’s This Week in Northern California, basically reported on the night of the march. In reality, what the video showed was frightened overwhelmingly peaceful protesters trying to escape fully geared and itching-to-go riot cops who had tried to enclose the marchers and cops who were about to begin assaulting not just innocent marchers but also bystanders and, later, neighborhood people. Such minor incidents would have been easy for the police to contain, given the presence of a thousand cops in uniform, all the police cameras, but also with all the – we must assume – undercover cops along these marches. Instead, the cops played the propaganda numbers game, bragging about 152 arrests, enclosing and mass arresting obviously nonviolent protesters: the easy ones to catch. And who are among the small property “vandalizers” and “looters”: undercover police provocateurs? I also have seen, defying any otherwise common sense, riot cops purposely try to antagonize and provoke nonviolent marchers. This would upset me if I were a nearby small business owner. At least one of those reporters and other TV reporters reported only “rumors” (gee, I wonder by whom?) 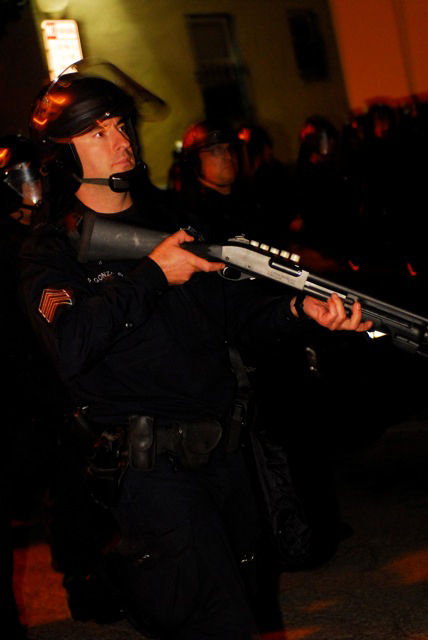 of a gun being pulled from the holster of a riot cop and pointed at the cop. Cops have video of everything else in these events; why don’t they have any video of that? It would seem to defy common sense. Let’s see YOU get close enough and for long enough, especially if you’re Black or Brown, to a phalanx of “itchy,” fully-geared riot cops to successfully reach for the gun and then wrest the latch off and then wrest the gun from his holster, let alone long enough to then point the gun at said riot cop. And then live to tell the story! Instead, you would be gunned down, along with any nearby protesters, in a hail of other cops’ bullets or wind up in a hospital emergency ward, critically beaten, unconscious or comatose and near death. These are the same cops who beat the hell out of Black people, if they are caught, for merely trying to run away! These are the same kind of cops who participated in the legalized murder of Oscar Grant for his merely trying to catch his breath while pinned face down on his chest! In fact, these are the same kind of cops who shoot and kill Black men, minding their own business, for merely standing in the doorway of their own apartment building (Amado Diallo, 1999) and reaching for their wallet or keys, or for merely sitting in their own car (Sean Bell, 2006) after their bachelor party the night before their wedding! It’s also laughable for the media to portray the police as actually being concerned in the slightest with protecting Oakland’s small businesses. 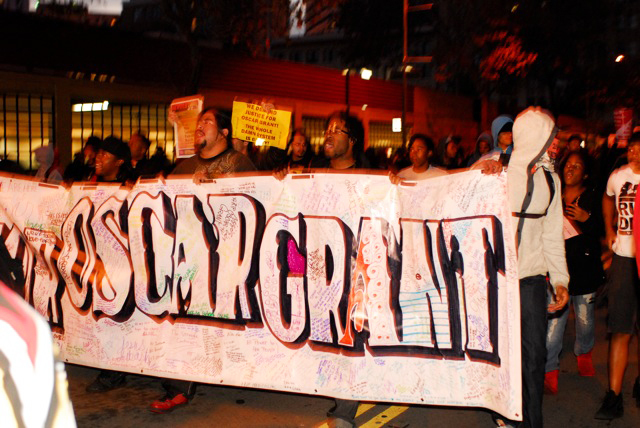 When a previous Oscar Grant rally supposedly “turned violent,” the same cops, in full riot gear and numbering in the hundreds, if not also up to a thousand, stood down and watched as they let the downtown Oakland Foot Locker be sacrificed – practically WAVING and FUNNELING looters into the store. You can bet that the cops wouldn’t have stood down and let nearby Wells Fargo Bank be broken into, because that would have been a political message by the protesters to the TV viewers that the TV viewers could appreciate about the people who financially loot all of US! Unfortunately, some middle-class TV watchers – especially those who are white (the most susceptible), but also of any color (and the older the viewer, the more generally susceptible they are) – fall for this manipulation. The mainstream news can always find one of these types to put a microphone and camera in front of, who will say how scared they were for themselves or their businesses. These people, probably none of whom have ever participated in any kind of dissident protest, where they then would know how police behave, watch suburban-looking reporters dressed up in nice suits, haircuts and overcoats and believe that since they are watching the (unbeknownst to them, highly edited and time re-arranged) video, they must be seeing “what actually happened.” They then monolithically condemn the marchers, especially EVERYONE who got arrested, and become even more pro-police. But, even though the cops don’t want to be judged by the so-called “few bad apples,” that’s exactly how the cops and the media monolithically judge the protesters – by even just “the few bad apples” and sensationalize them! When will I see mass, wholesale arrests due to mostly white people who tear up a city or college town after a major sports victory? Where are the mass arrests when white people show up — toting guns(!!) — at town hall meetings hosted by Congress members!? When will I see cops mass arresting 152 affluent suburban drivers because a few might be recklessly speeding or even driving drunk on Highway 24 or 680 in suburban Contra Costa County? Why weren’t even just all the participating cops on the scene arrested for allowing conspiracy (at least accomplices) to commit “manslaughter” when one of them outright killed Oscar Grant? It’s the same old media that harps about protesters not from Oakland, like Oakland is supposed to be some stepcity whose concerns, even tragedies, no one else is supposed to care about. Yet the cops rarely come from the community, and the media come from all over. Cops were there from even the outer reaches of suburban Contra Costa County and even from Sunnyvale! Well, police brutality and atrocities should be everyone’s concerns. You can see this ruling class strategy in action everywhere, on local, national and international issues. The true facts are distorted to look like their opposite! The right-wing media in Venezuela made it look like Chavez supporters were firing rifles on Chavez opponents, instead of what actually happened: just the reverse. The Israeli military made it look like Gaza flotilla passengers were attacking the Israeli soldiers, instead of what actually happened: just the reverse. When the cops, truncheons swinging, wade into a crowd and indiscriminately beat up people who are physically trying to protect themselves, the TV news makes it look like it’s the protesters violently “resisting arrest,” that pro forma police charge, and beating on the cops, “assaulting an officer,” that other pro forma police charge! It’s the old divide-and-conquer ruling-class strategy, executed by the corporate media, aimed at blocking people seeking positive, real, transformative change and social and global justice. 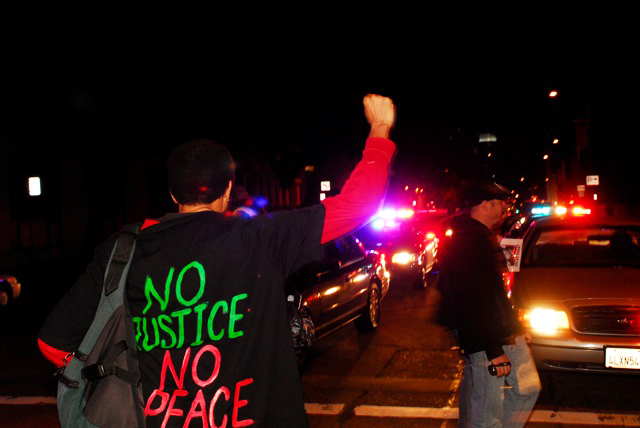 If we can’t have, and be permitted, an overwhelmingly nonviolent protest, about even violent atrocities – the legalized murder of Oscar Grant – by the cops, then what else is left to resort to? In this media propaganda environment, it’s critical to give support to the protesters and those very, very few reporters who do a good job reporting the truth instead of repeating police and government propaganda. One example is the highly respected journalist Davey D of Oakland, who has written excellent recent articles at daveyd.com about the Oakland protest on Nov. 5. Joseph Anderson is a Berkeley resident, a longtime grassroots progressive political activist; an occasional sociopolitical contributing writer to various publications; and the author of “Karmic Justice” about Lovelle Mixon and the cops vs. the victims of legalized police murders. Oakland – Announcement Nov. 5, 2010, of the light sentence of Johannes Mehserle to two years in prison with time served had a big impact on my neighborhood that evening, as the neighborhood filled up with hundreds of protesters fleeing from the violence of on-going police brutality and threat of arrest by Oakland cops. Around 7 p.m., my neighborhood, near the corner of Eighth Avenue and East 19th Street, was saturated with speeding squad cars, sirens blaring, and three or four helicopters flying overhead in tight looped circles with bright blazing searchlights, turning nightfall into a dazzling, brightly lit crime scene far down below. Both men and women were running by, some in their teens, but most of them were in their 20s and 30s and a few were older. A mix mostly of Blacks, Latinos and whites. Many were on bicycles. I could see the look of sweat and fear on people’s faces as they silently ran by trying to find a safe place to hide, far away from the cops that were chasing them with guns, night sticks, tasers and a one-way ticket to Santa Rita Jail. Some of those fleeing were looking for a place to hide in the bushes, in people’s driveways, behind the parked cars, under the porches and near the sides of buildings along the street. These were the same people who were protesting Johannes Mehserle’s sentence in downtown Oakland earlier during the day, who ended up near Laney College and then were later dispersed and chased into my neighborhood by the large brutal police force that had all the protesters on the run. Some protesters were on foot alone or in groups silently running along the streets and sidewalks, while others were on bicycles and in cars speeding down the street away from the sounds of sirens, bright flashing lights and the cops that were in hot pursuit. The air was wailing with sirens getting ever closer, until a squad car came blasting up the hill, suddenly screeching to a startling stop as it blocked the middle of the intersection at Eighth Avenue and East 19th Street. Watching the protesters fleeing in all directions along the street at that point, the cop in the squad car spun his car around and quickly dashed back down the hill to join up with other squad cars, blocking the street a block away. 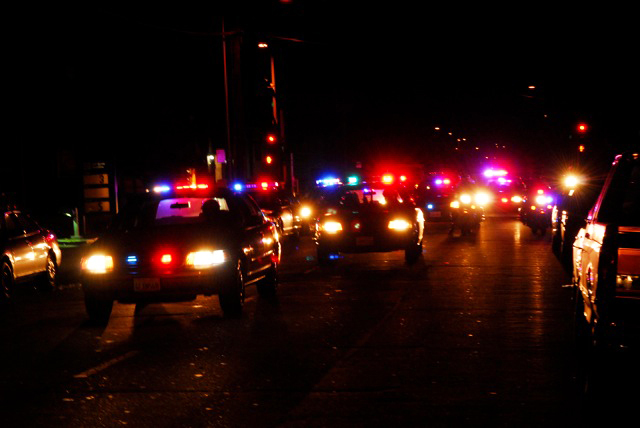 The bright flashing red and white lights of the squad cars were intense and bouncing off the windows and buildings along the street, as the local street cats scurried for the darkness of cover under the nearest cars to be found. I did not know it then, but the cops had declared that my neighborhood was a crime scene because of the protesters, and they sealed off the whole area block by block with hundreds of cops on the streets and in their squad cars, blocking many of the intersections and sealing off the whole neighborhood. Whatever rights my neighbors and I may have had before the cops appeared and locked down my neighborhood, our rights seemed to have been tossed right into the trash bins of history at that point, as we were all at risk of being arrested because we all resided right in the middle of a crime scene. As I stood on the corner of Eighth Avenue and East 19th Street for half an hour to 40 minutes, along with some of the protesters who were angered by the Johannes Mehserle sentence, I could understand why people feel that the system is broken and there is no justice in this world. Many of the protesters were out of breath by the time they reached the corner I was at and were very happy that they managed to escape capture from the cops. Soon they were off and running again, in fear that the cops may still capture them. At any time the cops could have come back and arrested us for standing out on the streets nearby, a block or two away from where a hundred protesters or more were being arrested. It was a tense scene. From our position, we could see numerous squad cars a block away and could hear the shouts of protesters yelling at the cops as they were being rounded up, arrested and lined up to be taken off to Santa Rita Jail. 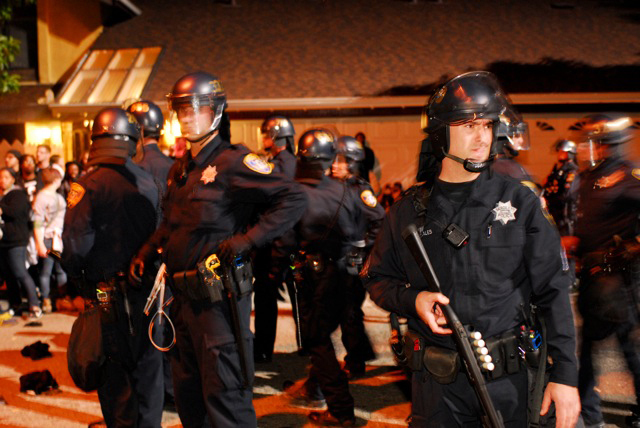 The large police force that was menacing the whole neighborhood with their fascist police tactics were serious about catching as many as possible of the protesters who were marching down the streets of Oakland, in protest against the light Johannes Mehserle sentence. I too was angered and felt that Johannes Mehserle should have gotten a minimum of 14 years for executing Oscar Grant at the BART station on that fateful New Year’s Eve. All in all, 152 people were blocked off in the nearby streets and cornered and captured by the police in my neighborhood, who then proceeded to arrest everyone that was targeted, captured and trapped by their brutal tactics. For many, there was no escape and no place to run or hide. Dozens of others reached the safety of my street and silently ran off into the shelter of darkness just out of reach of the fascist police state that was intent on hunting them down, as if in sport. Additionally, some cops were cruising the streets in unmarked cars, but the protesters spotted them in a heartbeat and started calling them “pigs” and told them to get lost, as they quietly drove by the numerous protesters milling around that appeared to be out of their reach. Overhead, the noisy helicopters flew in circles for three to four hours while the neighborhood was in full lock-down, as 152 protesters were captured and arrested in my neighborhood. Lynda Carson may be reached at tenantsrule@yahoo.com. 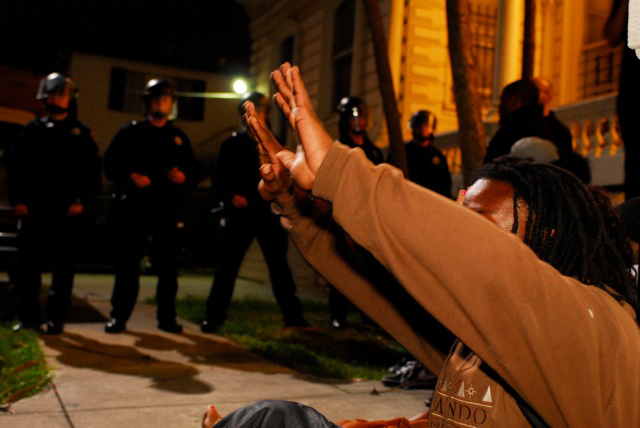 Previous articleWhat part of ‘killed_unarmed_Black_man = murder’ doesn’t OPD understand? Next articleHard Knock Radio needs your help! as Oscar Grant to death themselves! America simply because you elect a person as President whom is half person of colour does not mean we have arrived at an equal footing for justice for all. In my humble opinion this day shall never happen for the bitter bile of race hatred is engrained in every cell of a fetid corpse that is completely incorrigible! It is *very* eloquent and *very* moving. It woud make anyone with a heart feel like they were (almost) there! THANK YOU LYNDA AND THANK YOU BAYVIEW! I'm sending out your article title and the sfbayview link to my email list! It is a story about the people in Oakland who are protesting the ridiculous 2 year sentence Mehersle recieved for killing Oscar Grant. Look at the comments made by police.com members after a story about asian american Jason Yang. Jason was running from police after a fight outside a nightclub and jumped to his death from a downtown Minneapolis freeway overpass, police said. Once again policelink.com members, many of them police officers, make hateful and caustic comments about jason and call him names. However look at the comments by the cops on policelink.com after a story about a dog that fell 80 feet off a cliff. A deputy risked his life to save the dog.